DURHAM – In the first-ever edition of the Durham Warriors Survival Challenge, a “Survivor”-style fundraiser held last weekend in Durham to benefit military veterans, South Carolina resident Russell O’Cain outwitted his 17 fellow contestants to claim victory. His prize? “It was $999,999 less than what I got,” said Bob Crowley, the “Survivor: Gabon” winner and the host of the three-day event. Crowley, a retired Gorham High School physics teacher who divides his time between South Portland and Durham, shot to fame in 2008 after winning the $1 million reality show. He said his event was a success. In total, 18 contestants from across the country, including four from Maine, took part in the contest, which closely mirrored the rules and routine of the popular television show. 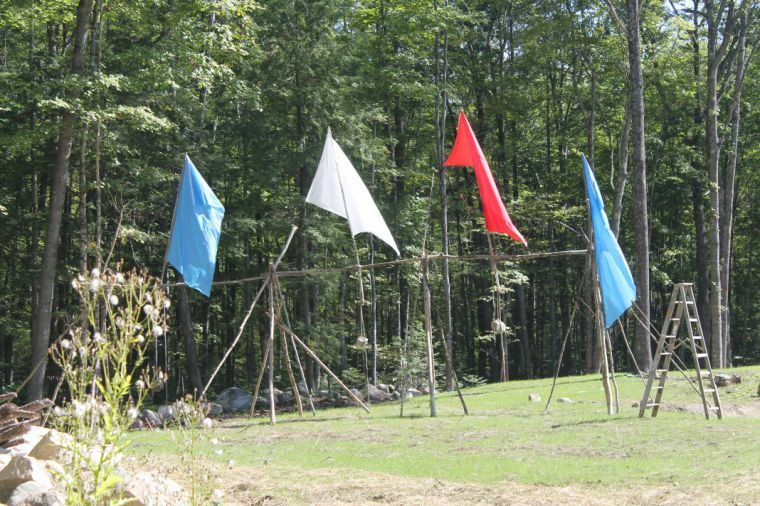 The sprawling 100-acre grounds of Crowley’s newest venture, Maine Forest Yurts, served as the locale. As a nod to Maine, the immunity idol was a lobster shell donated by a local artist. The three teams of six contestants each had a surprise visitor on Saturday with the appearances of former “Survivor” contestants Terry Deitz, Eric Reichenbach and Kenward “Boo” Bernis. Despite his resume, Deitz, a contestant on “Survivor: Panama,” was promptly voted off the “island” by the tribal council. “He had to go back to work,” said Crowley. The top four finishers featured two from South Portland: physical education teacher Dianne Kazilionis and builder Michael Friedland. Topsham resident Kevin Thurber was the oldest contestant at 64, but managed to avoid his worst fear of being voted off first. Challenges included having members of the three teams – named Penobscot, Micmac and Maliseet – shooting tennis balls over a pond into a field, where other team members would try and catch them with a small net. Contestants paid $250 and the cost of their travel to participate. The Durham Warriors Project pays for the cost of a military veteran and family to stay at one of the yurts – a welcome distraction, said Peggy Crowley. “It gives them an opportunity to enjoy the quiet of Maine,” she said. Bob Crowley hopes the survival challenge will be a yearly event. He said he intentionally kept things small – the public was not invited – but anticipates adding an area for spectators at some point. The weekend drew a mix of self-described Survivor junkies and volunteers like Melissa Barter who was a friend of one of the contestants. “It’s really a cool and fun concept,” said Barter. So as someone who has won it all, how would Crowley rate O’Cain’s skills? 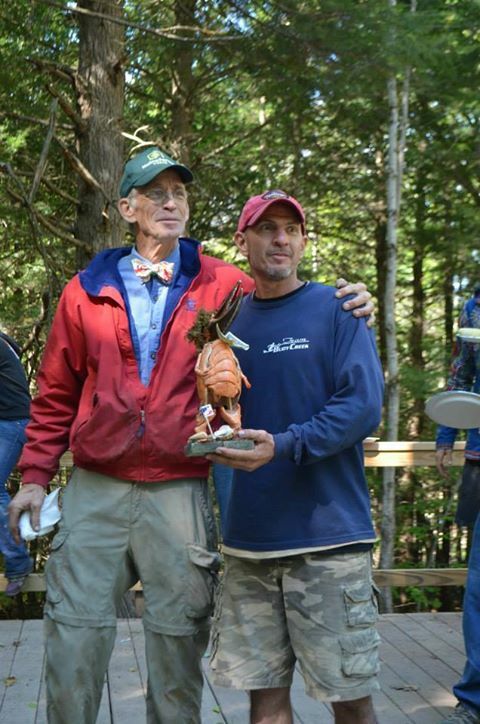 Bob Crowley, 2008 winner of “Survivor Gabon,” sporting his trademark bow tie, congratulates Russell O’Cain, who won $1 in the inaugural Durham Warriors Survival Challenge on Sept 8. The challenge is modeled after “Survivor” with many of the same type of challenges. 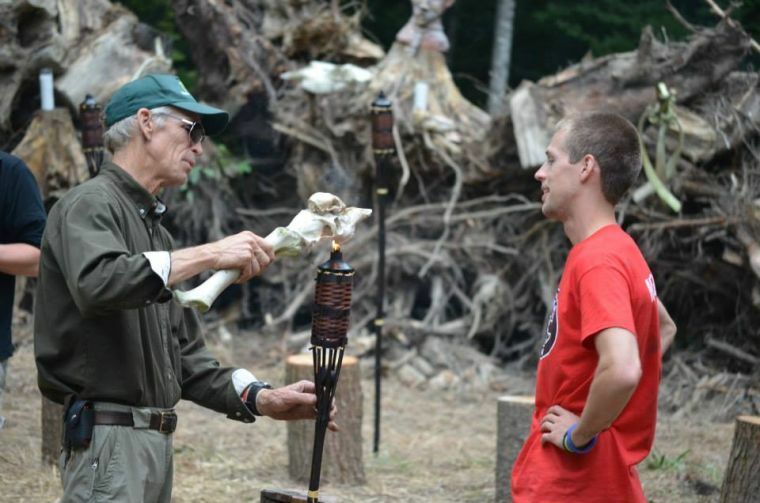 Bob Crowley douses the flame of former “Survivor” contestant Eric Reichenbach during the inaugural Durham Warriors Survival Challenge on Sept. 8. Reichenbach was one of three former contestants of the long-running reality show to take part in the event at Crowley’s 100-acre property in Durham. The Durham Warriors Survival Challenge final four include, from left, first runner-up Daniel Beale of Washington, D.C.; challenge winner Russell O’Cain; fourth-place finisher and South Portland resident Dianne Kazilionis; and second runner-up Michael Friedland, also from South Portland. Flags mark the entrance of the main competition area for the inaugural Durham Warriors Survival Challenge in Durham last weekend. The event, hosted by former “Survivor” winner Bob Crowley, featured contestants from across the country and the appearance of three former “Survivor” competitors.